With our extensive experience, we analyze the best displays and software in the market to suit your needs. One of the best ways to get the attention of your audience is through Digital Signage. With different platforms you are able to provide important information to your clients while encouraging them to interact with your company. Implementing a signage solution is a simple solution to provide interaction with your clients or employees. Using signage is a great way to engage people and grab their attention. The best way to do so is through engaging, custom content. 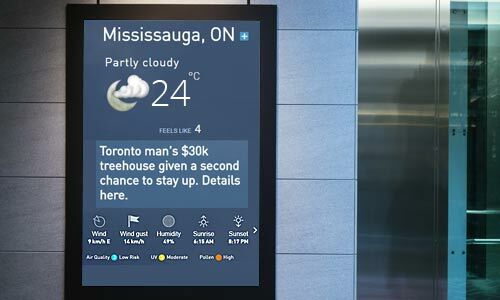 With signs located in public areas, it is easy to display information to your customers and employees with content managed by digital signage media players. By providing a clean schedule, it allows customers to easily read and comprehend information that is being displayed. Looking to increase awareness of your company? Through digital signs you can run various types of company branding platforms, for example your social media stream. We offer a complete range of display monitors, along with content management software. Content management software allows you to customize what will be running on the digital signage platform, from one to multiple monitors. Digital Signage is a very popular application for many uses including education, healthcare, food service, internal communications, retail, and hospitality.